"Do we really want to put more trucks on the road?" Hennings said. "We don't want to do that. This is one way to alleviate, if we want to have clean air." With the federal government seeking public comment on the Columbia-Snake river system, the Washington Association of Wheat Growers reaffirmed their opposition to breaching dams on the Snake River. 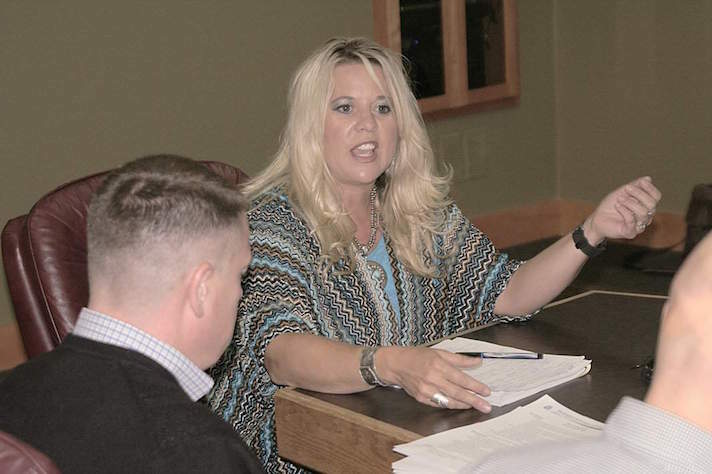 "It would be devastating to the industry," said executive director Michelle Hennings. Removing the dams would mean the river would not be useful for transporting wheat, Hennings said. "It is vital that we keep our transportation system intact," she said. According to WAWG, the river system is the top wheat export gateway in the United States and the third-largest grain export gateway in the world. To move the same amount of wheat by road or rail would require 137,00 semi-trucks or 23,900 railcars, increasing fuel consumption, emissions and wear-and-tear on roads and railways. "Do we really want to put more trucks on the road?" Hennings said. "We don't want to do that. This is one way to alleviate, if we want to have clean air." Roughly $3 billion of commercial cargo moves on the system, giving growers in the Midwest access to international markets. Barging is one of the lowest cost, most environmentally friendly modes of transportation available, according to WAWG. A typical four-barge tow moves the same amount of cargo as 140 railcars or 538 trucks, and uses less fuel. WAWG members are attending various scoping meetings put on by the U.S. Army Corps of Engineers, U.S. Bureau of Reclamation and Bonneville Power Administration. The deadline to comment is Jan. 17. Some environmental groups claim breaching the dams would "save the environment," Hennings said. WAWG is monitoring the situation closely, and hopes to offer insight during hearings about the river system, Hennings said. "It is very important ag tells their story to the ones who don't necessarily understand the situation," she said. 137,000 semi-trucks x 910 bushels/semi-truck x 60 lbs/bushel x 1 ton/2000 lbs = 3.74 tons of wheat. 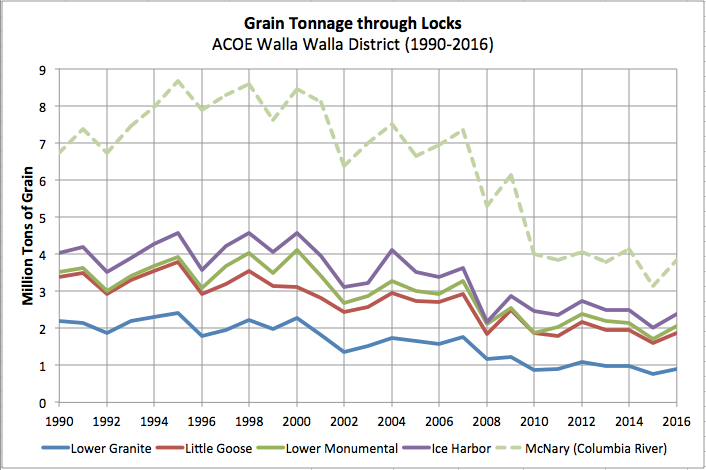 This fits somewhat well (but a little too high), with the chart displayed using Army Corps of Engineers lockage data.